The vacuum cleaner DS 5.800 with water filter not only provides thoroughly clean floors, but also ensures fresher, 99.9% dust-free exhaust air. And a far more pleasant indoor environment. 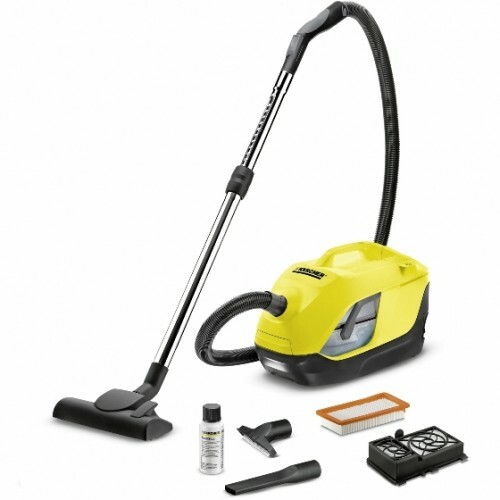 In contrast to a conventional vacuum cleaner with filter bag, the newly developed vacuum cleaner DS 5.800 with water filter relies on the natural power of water being swirled around at high speed within the filter. The dirt that has been drawn in is piped through the swirling water, reliably filtered from the air, and bound in the water. The result: exceptionally fresh, clean exhaust air. Quick and easy intermediate parking of suction tube and floor nozzle during working interruptions. Space-saving storage. As powerful as a 1,400 watt device. Fast, convenient power cord storage at the push of a button. All accessories can be neatly and accessibly stored in the provided accessory compartment.